An email linking to a website titled “Explanation of how the room draw process works” has raised eyebrows for its content that ridiculed independents and offered inaccurate information about gender neutral housing. The email was shared at 2:50 PM on Tuesday by the Director of Student Life for Mathey, Dr. Darleny Cepin. The link came after an announcement notifying Mathey students about an Info-Session on room draw. The website, previously sent to Mathey students from 2016 and 2017, features a talking computer-headed stick figure giving a tutorial on room draw in over 30 slides. The site states that the rules of room draw are “confusing”. Many independent students identify as lower-income. In previous interviews with The Tab, lower-income Princeton students have expressed that becoming independent was the more financially sensible option. 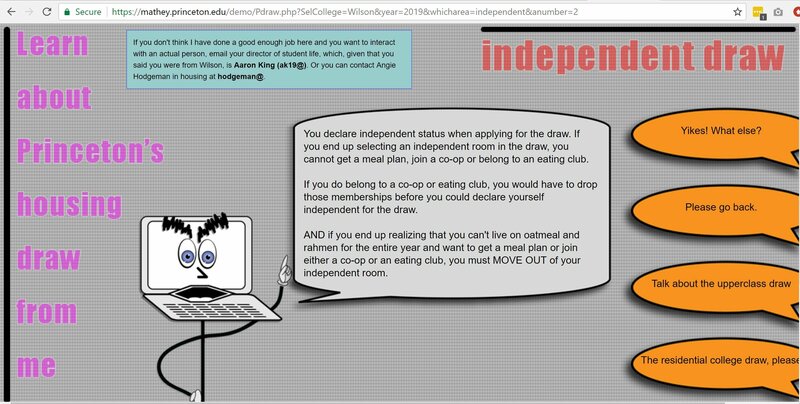 Additionally, the page innaccurately refers to room draw for the Two Dickinson Co-op as a part of independent room draw. In two places, the website inaccurately states that upperclass housing, with the exception of Spelman, is not gender neutral. This policy was changed starting in 2017, when all rooms are designated as gender neutral. “For rooms classified as independent in upperclass housing,the same rules apply as for Spelman except these rooms are not gender neutral. SOOOO sorry,” the site incorrectly reads. The copyright on the site is for 2018, though another source of information in the email, a YouTube video, is from 2013. The site has no clear authorship. Even though it is located on the Mathey subdomain of Princeton's website, it has sections for all residential colleges. The URL indicates it is a “demo”. Neither Housing nor the Director of Student Life for Mathey could be immediately reached for comment.